Don't worry, they keep us busy and time flies up here. Safe travels and see you shortly! I will see you up there Chris. I start Nov.9th. Guys welcome and your choice to go to Roehl is a fine one. I started there, but been gone quite some time. Still have friends there. Equip is well above average. There are pro's and cons to every company, but in my opinion to start out you will be fine there. Johnny. I'll be in Midwest Dry Van. I hope to get on the dedicated Kraft after a few mos. of Midwest Dry. Johnny I start Roehl on 11/9 in Appleton Where are you going to for training? Hopefully Daniel B. Will post a link of his guide. I can not find it anywhere. I have seen post like this before. I too am an Illinois resident that is going to Roehl for company sponsored training. I already got my permit in Illinois. I asked Stephanie from Roehl if I would have to retake the driving test after I passed mine at the Co. Sponsored training program. She has told me they have everything ironed out and i would not have to take anymore tests in Illinois. If I was to have problems at local DMV to give her a call, they have a contact within Jesse Whites office. Did the full app online last night and next a voicenail for the PHX recruiter today with some questions. No word yet maybe she was off today. Enjoy that vacation. Things move really fast after they do the DMV and background check. It took 3 days after my initial call from them. Have they emailed over anything to you yet? I was really impressed with how fast things went. Like I said I am really happy I did only one application and that was for Roehl. I am worse than an old man, I don't like change. I am not a job jumper. Hopefully Roehl and I will be a good fit together. Two weeks in Mexico to decompress is what I need after leaving my current job! Congrats. 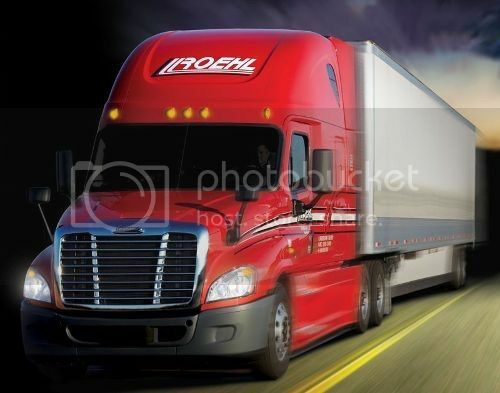 I am also looking into starting with Roehl in the get your cdl program. Where are you training? I am trying for Phoenix. Pitmaster, I will be attending in Appleton, Wi. Midwest boy here. Have you heard anything from them yet? Good luck. We'll have to share notes on the training. I got a definite start date for Roehl's company sponsored training of Nov. 9th. I could have started next month but wife and I have already paid for a vacation to Mexico with in-laws (brothers and parents). I am sooo ready to start. I wish I could've got in earlier but, the Oct. date would've been 3wks in to training. Roehl has been great to work with throughout it all. I am fortunate that I got a call so fast (2 hours) from them after I applied online. They were the only company I applied to. I have read great things about them and look forward to starting a career with a company as great as Roehl. I too am an Illinois resident that is going to Roehl too. I asked Stephanie from Roehl the same thing. She has told me they have everything ironed out and if I was to have problems at local DMV to give her a call, they have a contact within Jesse Whites office. Coca cola Pepsi or dr pepper? I have not started driving yet. I am scheduled to start my company driving school in November. I have been a car salesman for 6 yrs. I have drove local back when I was 18 yrs old and off and on through the yrs. I had to give up my CDL when I moved to Illinois because I did not have access to a tractor at the time. The reason for the decision to go OTR is that I am tired of having to deal with the public in a retail setting. The newer people working with me think I have a sign saying "Tell me your problems" on my office door. I just want to be out on the road and not having to talk or listen to anyones problem. I applied to a company that has is offering CDL Training. Everything is a go. I got a date to start training BUT the job I applied for they didnt offer me. I applied for a dedicated route that puts me 2 hrs from home and 30 mins from my son. That gets me home 34-48hrs. Also my decision for that is I am new at OTR and feel this would be the best way to adjust to my new career. They offered me a regional that puts me home 24-48 hrs 80%. They said I will have to talk to the fleet manager after I start. Should I be more persistent to get the dedicated route?